The air is still cool under a dreary downtown overpass, but then it is only 7:30 am. Hundreds of shoppers pick through impressive mounds of produce, haggling for what seems to me already rock bottom prices. But then, I am the only non-Asian person I see and this is not a chic farmer’s market that draws a clientele looking for decorative displays of organic edibles at top dollar. 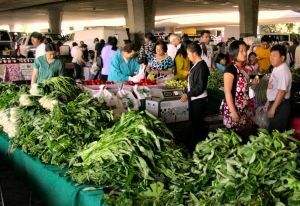 This is the Stockton Asian Farmer’s Market. Saveur Magazine listed this market as “the best reason to get up early.” Serious shoppers arrive at 6 a.m. I am here in particular looking for fresh herbs that feature so prominently in Vietnamese cuisine. Platters of just-picked herbs and delicate greens grace Vietnamese tables, ready for each diner to garnish his soup or fold into rice paper or lettuce rolls. Feathery cilantro, tender-leafed Asian basil, celery leaf, red perilla… all more freshly fragrant and delicately textured than herbs found in American markets. On this late summer Saturday my fellow shoppers represent a window into the ethnic history of Stockton. The city was founded on a deep arm of the San Joaquin River, navigable year round by quick river boats from San Francisco. Gold miners and the goods they needed gushed forth from Stockton toward the hills. By the mid-1850s a few hundred Chinese passed through Stockton heading toward the newly discovered gold fields. By the 1860s they had settled into laying tracks for the transcontinental railroad. By the time the track was complete California had become an agricultural state. In 1868 a handful of Japanese arrived as contract agricultural workers. Like the Chinese they were thought of as cheap, reliable workers. Korea signed a friendship agreement with the U.S. in 1882 leading them to jobs in the Central Valley as well as the sugar cane fields of Hawaii. This new source of labor came just as the Chinese Exclusion Act of 1882 was signed into law halting immigration, land ownership and other legal rights of the Chinese. In the next century these more recent immigrant groups would become targeted for discriminatory laws as well. The year 1942 saw 4, 271 Japanese residents of San Joaquin County held in an internment site at the fairgrounds in Stockton. The Philippine Islands became a protectorate of the U.S. in 1898 and its people were now citizens, free to come to America. By 1946 Stockton was home to the largest Filipino community in the U.S. which was centered around a compact area of downtown known as Little Manila. The city became home to thousands of Vietnamese and other South East Asian refugees during the 1970’s following the Vietnam War and the political atrocities in Laos, Thailand, Cambodia, Sri Lanka and other countries. On this Saturday at the Farmer’s Market a local Filipino bakery displays an array of sweet buns to a Tagalog-speaking crowd. A Chinese-American family watches over pens of live chickens, pigeons and geese. The fish sellers offer bits of trim and pieces that the less-thrifty would toss: salmon heads and skin, purple-red collars from ahi tuna, fish frames. 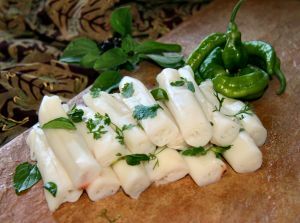 Someone sells just-made rolls of soft rice noodles. A kitchen truck has fried snacks from everywhere – spring rolls, samosas, lumpia, French fries and fried chicken. The market claims to handle up to 9,000 people a day in summer, when the heavily-laden produce tables grown under heaps of yard-long beans, water spinach and bitter melons. I can imagine that most of these shoppers come every Saturday to see what is coming into season and to be surrounded by the lavish abundance of the Central Valley. No one seems to notice it all takes place in a non-descript parking lot under a central freeway overpass in Stockton. It is not fancy, it is just home.